Here's a really simple set of experiments using plain table salt and water (and a little food colouring if you want to). You can swap the salt for sugar if you want an even safer version for toddlers if you think they might try to drink the experiment, and glass for plastic cups. I set up paper place mats with small glasses (old Nutella glasses in this case) half filled with water - one glass cold water, the other warm water. I added a pot (an old Gu pud ramekin) full of table salt and a spoon, and wrote labels on the paper to help with identification and word recognition. 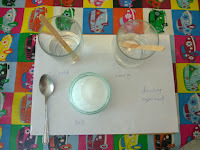 The task for the boys was to add a level spoonful of salt to each glass and stir it (lolly sticks) until the salt dissolved. They would know it had dissolved when the water went fully transparent again. 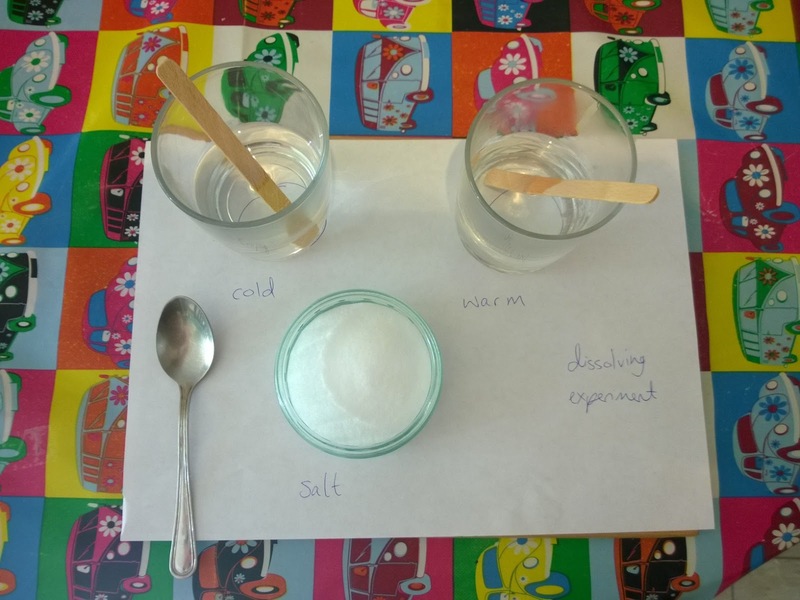 They observed which one went transparent again first - it should be the warm water - and we used the science terminology to describe it 'the salt dissolved in the warm water faster, we could see that the warm water went transparent again faster'. They didn't ask why, so I didn't volunteer the information (it's a mixture of the water molecules moving faster in hot water and therefore coming into contact with the salt faster, and the heat of the water reducing the strength of the hydrogen bonds enabling the salts to form new solute-solvent bonds - I think we're not quite ready for this level yet). The boys could then repeat this process, making a mark if they wanted to record how many spoons of salt were added, until the water wouldn't go transparent again. At this point the water couldn't dissolve any more salt and it was saturated with salt. 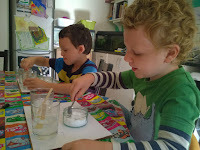 The boys had a lot of fun transferring salt to the water and stirring it. 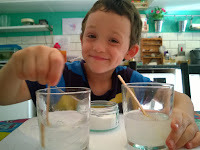 When the solution was saturated I encouraged them to tip the rest of their salt into one of their glasses and give it a good stir up to make sure it really was saturated with salt. You could stop at this point and leave it as a stand-alone dissolving experiment if you wanted to keep it short and sweet, or continue for the extension in part 2. Part 1 is deceptively simple but develops fine motor skills in transferring and stirring, plus language and observation skills. Part 2 builds on language and observation skills further. For part 2 we wanted to look at whether salt crystals would be larger if they were produced by fast or slow evaporation of the water in the solution, so I added a little food colouring to aid visibility. Ollie predicted that evaporating the water off quickly would result in small crystals, based on what he knows about the formation of rocks from cooling lavas which was nice evidence of transferring existing ideas to new situations (rapidly cooling lavas produce glassy rocks with crystals so small to be indistinguishable, such as obsidian, while slower cooling lavas and magmas produce larger crystals which can be seen more easily, such as in granites which form when magma cools fairly slowly in underground chambers known as batholiths). We put some of the salt solution onto glass slides, but also some into the bottom of more glass ramekins - we happen to have slides but, if you don't, any small dish will do fine. One set of slides was left to evaporate slowly on a windowsill on the shady side of the house, the other on a windowsill in full sunshine. I used the salts which formed in the ramekins as a touch exploration media, so the boys could feel the difference in the texture of the salt crystals and be less likely to immediately remove the crystals on the slides by poking them. The boys could clearly see there was a difference between the slides, and talked about chunkier crystals on their own on the slow dried slide compared with the moosh on the fast dried slide. As before, you could leave it at that, but since we happen to have a microscope we continued (it was bought years ago at Lidl for £40, but the same model available on Amazon for £88 at time of writing - I wouldn't personally bother with microscopes from toy shops as they tend to disappoint but even a hand lens or a magnifier app on your phone will give you some extra investigative power if you haven't got access to a microscope). The microscope I have comes with a camera attachment, but we couldn't get the software to work any more since I had to upgrade my laptop. This camera doesn't have great resolution anyway, but was handy last year when the boys were smaller as it meant they weren't fighting to look down the same eyepiece and constantly changing the focus. 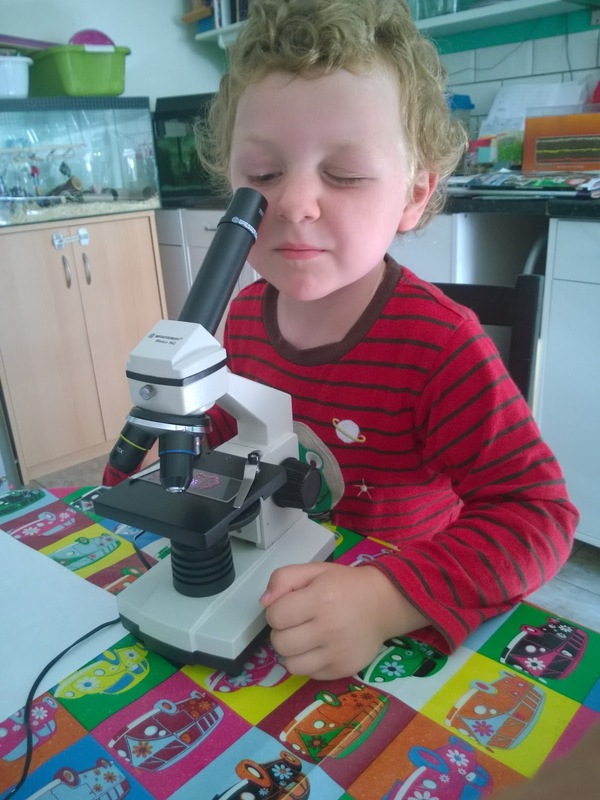 Now however they both really enjoyed using the eyepiece and even got to grips with changing the slides and focussing the microscope for themselves (I only let them do this on the lowest magnification as they couldn't wind down too far and damage the lens on this one). I wasn't sure how well they would respond to using the microscope with just the eyepiece, so the night before I took some images using my phone in order that the boys would have something to see even if they didn't get on with the eyepiece. This was a highly untechnical operation - I cupped my hand as a tube around the eyepiece and balanced my phone on top of my hand. I got the best results by turning down the light intensity under the stage, turning the phone setting to 'close up', turning off the flash and just making small adjustments to how high above the eyepiece and what angle it was at until I got good shots. The benefit is that the resolution was good and worth the frustration of a dozen crummy shots for every good one. 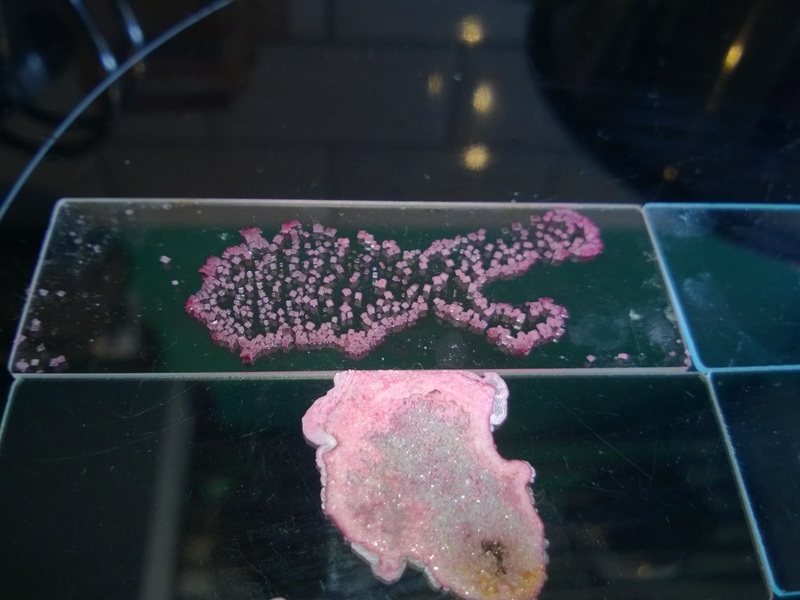 The top photo is of the salt crystals that were on the slide that was evaporated rapidly. The bottom one is from the slowly evaporated solution. The magnification is the same for each so you can really see the difference in the size and formation. 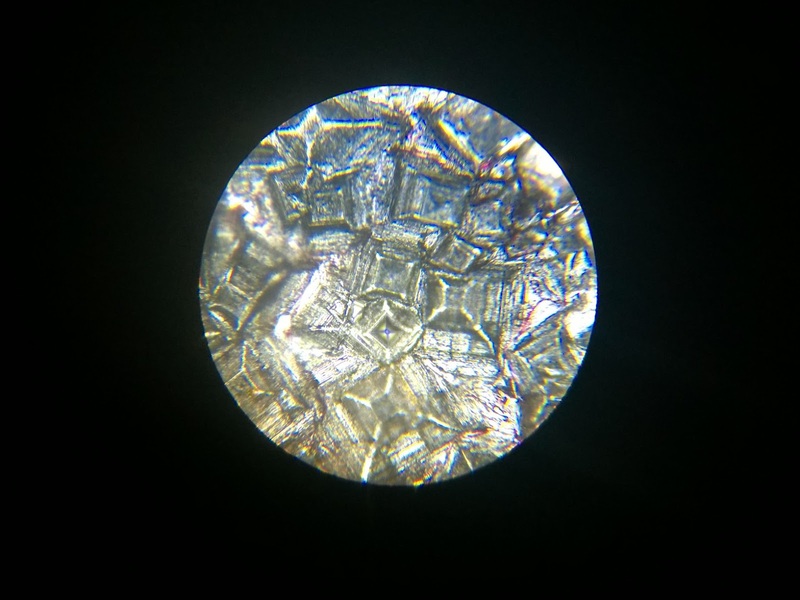 The shape is a sort of pyramid - if you want to see this form large enough to handle and see without magnification then Maldon Sea Salt (available in the UK from supermarkets) has crystals in the same shape but a couple of millimetres or more across. 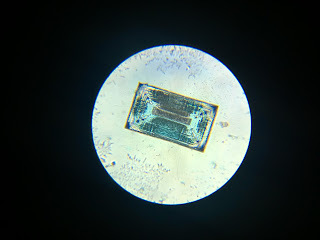 The magic of microscopes is the kids reaction - they kept looking at the slide on the stage, then back in the eyepiece as they couldn't believe what they were seeing was the same little dot of salt. I can well understand the craze for the unseen miniature world around us that sprang up following the invention of the microscope. It really is an addictive past time when you get going with one. So there it is, three simple things to do with plain old table salt.